First of all I feel I should recommend this park to you because it is one of the natural wonders of Asia, not to mention a UNESCO World Heritage Site. It’s the most spectacular national park in Vietnam, with mountains covered with tropical jungle and rivers that proudly flow out of the gorges that open out of the mountains. Here nature was gentle and superb, gifting Vietnam with an impressive underground system: the largest caves in the world. The park is located in central Vietnam, more or less where the country begins thinning out and everything becomes more serpentine, between Laos and the sea. There are lots of ways to get there, whether you’re coming from the north or south of the country, seeing that it’s the park destination with the greatest natural interest. It’s located about 7 hours by bus from Da Nang and 5 hours from Hué. You can also get to the park by motorbike. However I recommend that you don’t enter the park with the bike if you don’t have much driving experience. I went to Son Trach, a small town of 3.000 souls that has developed in recent years (with hostels, guest houses and hotels, restaurants), in order to welcome the wave of travelers that increases with every month. Personally I stayed at the Easy Tiger, a guest house with dorms and private rooms at a good price, breakfast and bicycles included. An ethereal beauty on earth, the park is made up of the oldest limestone mountains in Asia. They are thought to have formed at least 400 million years ago. It’s a paradise for speleologists, but also for fans of nature and adventure. There are about 300 caves inside the park. Discovery of the caves was rather recent, going back to the early 2000’s, and it’s only since 2015 that there has been access to the cave system, which still hasn’t been completely explored. The majority of the park is covered by jungle and primary forest, with evergreens. Moreover, there are about 100 different species of mammals, among which are tigers, elephants, Asian antelope, reptiles, amphibians and birds. Which caves should I visit? As I said there are about 300 caves. I was able to see Huong Toi, better known as “Black Cave” and Thien Dong, or “Paradise Cave”. To get to Black Cave there’s a zipline that passes over the wonderfully blue water. You have to then enter the cave again with a light attached to your orange helmet, you’ll then go on until a room where you can take a mud bath. At the exit, the adventure still isn’t over: by kayaking across the water, you’ll come to an area where, suspended over the river you’ll find many enjoyable activities: zip-lines, ropes and lots of emerald pools reflecting the mountains in wild Vietnam. Paradise Cave, on the other hand, is located 14 kilometers from Son Trach and it’s an expansive network of caves surrounded by jungles and karst mountains that extend for 30 kilometers, but I, like the majority of tourists, only saw the first kilometer. You have to travel a bit to get to the cave, while at the entrance to the cave there’s a wooden staircase that will bring you into the depths; you’ll be submerged and amazed at the sharpened stalactites that hang from its tall ceilings and impressive stalagmites of different shapes and colors that change shape every day as the wax melts. Magical. 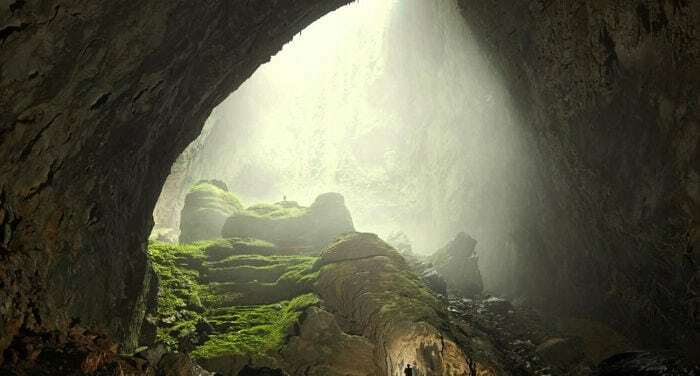 The most impressive and largest in the world is Son Doong Cave, whose underground systems extends as far as Laos: the cave’s dimensions are 200 meters wide and 250 high. This cave was only opened in 2013, so consider yourself fortunate if you’re about to take a trip to Vietnam, since you’ll be able to visit it. Yes, the cave isn’t accessible to all, but rather takes quite some training to visit it (and a bit of money available). On the National Geographic website you can have a wonderful interactive experience inside this wonder. The only tour operator authorized for the circuit inside Son Doong Cave is Oxalis. Consider an expedition of at least 7 days, since the cave is located in a remote zone of the park and a budget of at least 3,000 American Dollars. I recommend that you book a guided tour. You can visit the park on your own and save some money, but a tour guide, being an expert, will give you the exhaustive information about animal life and history that I appreciate when in a new place. Coming into direct contact with local people, asking them questions, getting interested in and truly discovering that place, also favors tourism development. If you decide to see the park on your own you can rent a motorbike and take Ho Chi Minh Road, number 20, which crosses the whole park. Or opt for a good old, ecological bicycle. What is there to see in the neighborhood? Other than the caves there are other things to do if you stay for at least three days. One day for the caves, one for excursions into the forest and one for a bicycle tour through the numerous rural roads. You can also choose to discover the country’s war history by visiting the Phong Nha Museum, a black and white photographic trip through the war in Vietnam. Sticking with the war theme, if you’re a fan of history, I suggest you take a tour of the tunnels of Vinh Moc: a nearly 2 kilometer long underground labyrinth where hundreds of Vietnamese families took refuge and went on with their lives, although above their heads bombs rained down without letup. The refuge was built in 18 months by civilians and the Vietcong. The history is long and should be known so as not to forget. The park wasn’t accessible until a short while ago, because it was strictly controlled by the army. It still remains a very restricted place because the entire surface (885 square kilometers) is littered with unexploded bombs, a sad reminder of the war. In particular, the area of central Vietnam was sadly the famous demilitarized zone – the DMZ – a neutral area between north and south Vietnam, during the period of 1954 and 1975. The most absurd thing about this history is that although being a neutral zone, it was instead the setting of the fiercest battles during those two decades.